Quality Machine is a contract machining company that has been most competitive in the machining of gray and ductile iron castings, aluminum castings, steel burn-outs, steel forgings, and tubing. QMTW provides total manufacturing services. To meet customer requirements, QMTW selects material sources and coordinates the design and development of all required patterns, tooling and gaging. When highly specialized secondary operations are required, QMTW subcontracts these operations. In order to achieve maximum utilization of machine tools, QMTW has built the machining plant around the cell concept. The cells are primarily composed of CNC equipment and incorporate conventional machinery when applicable. Secondary operations, including balancing, deburring, and assembly are included in the cells when cost effective. This concept has been expanded to include standardization of the cells. The resulting inter-change-ability affords maximum flexibility in capacity planning. For over Fifty years Quality Machine and Tool Works Inc. has been a regional provider of contract machining services located out of the same location in Columbus Indiana. QMTW is an owner operated business that has been a consistent employer in the community since its inception. 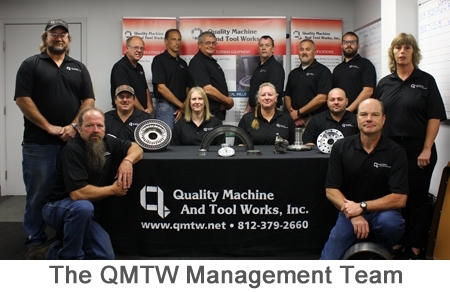 Spawned by the service tool industry in the beginning QMTW now supplies contract machining services to several major manufactures in the region and overseas. All machining services are supported by a certified QMS since August of 1998 with ISO-9002/QS-9000 and currently to ISO/TS-16949:2009 and environmentally to ISO/14001:2004. 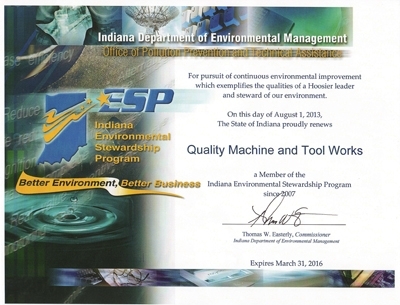 In early 2015 we were approached by the Indiana Partners for Pollution Prevention to present our 2014 Environmental Project that impacted sustainablity. 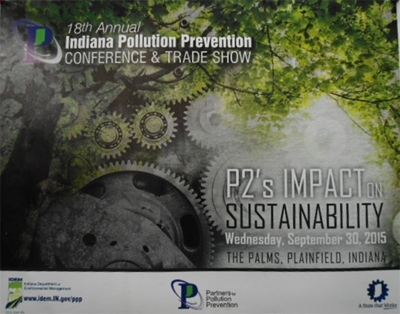 Our 2014 Project was presented at the P2 Conference on September 30. We have been members of the Environmental Stewardship Program (ESP) since 2007 and have completed projects from reducing natural resource usage with measureable returns on investment to community service.